To make the caramelized shallots, heat 1 tablespoon of olive oil in a medium saucepan over medium heat and add shallots. Saute until translucent, about 5 minutes. Add 1 tablespoon of water and 1 teaspoon of brown sugar and continue to cook until shallots are browned and caramelized, about 10 minutes. Set shallots aside in a small bowl. To make the crostini, put oven rack in upper third of oven and preheat oven to 350°F. Put bread slices on a baking sheet and brush slices with oil on both sides. Season lightly with salt and pepper, then bake until pale golden, about 10-15 minutes. If you are grilling the crostini, heat over medium high heat and grill each side for 3-4 minutes. 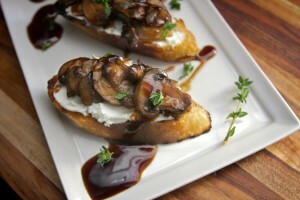 When crostini are cool to touch, rub a clove of garlic on the top of each crostini. To assemble bruschette, spread 1 tablespoon of goat cheese on top, spoon the slightly warm mushroom mixture on top of goat cheese. Repeat until all crostini are topped. Plate the bruschette and sprinkle tops with reserved thyme leaves, a pinch of salt, and drizzle each bruschetta lightly with aged balsamic vinegar.